HAYDN: Composed in around 1803-06, these two movements are the concluding chapter in Haydn’s monumental string quartet oeuvre. In failing health and unable to complete the remaining movements, Haydn dispatched this fragment to his publisher with the quote: “I am old and frail; my work is done”. Enfeebled though his body may have become, these movements are vintage Haydn and a fitting final bow from the man who first elevated this genre. 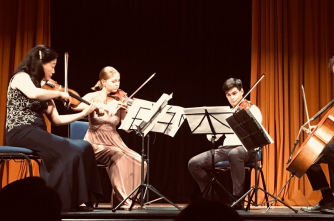 SHOSTAKOVICH: Shostakovich’s string quartets often served as vehicles for his most introspective and private musings during the unspeakable hardships of life in the Soviet Union throughout WWII. As they took their toll on Shostakovich, the composer emptied his melancholy and fervour into his music. Undoubtedly one of his finest and most skilful quartets, Op. 73 was composed in 1946 and reflects the erratic nature of Shostakovich’s emotions, bounding from lively and energetic to furious and mournful. DVOŘÁK: This G major quartet was written at the end of 1895, soon after Dvořák returned to his beloved Czechoslovakia after three homesick years in New York as director of the National Conservatory of Music. The first movement opens with a cascade of birdsong-like melodies, the joyful trills and leaps reflecting Dvořák’s delight at being in his native countryside. The glorious second movement, one of chamber music’s most beautiful, is dark and melancholic. This magnificent composition continues to thrill right up until its triumphantly exultant conclusion.